You’ll need some strawberries and a paring knife. 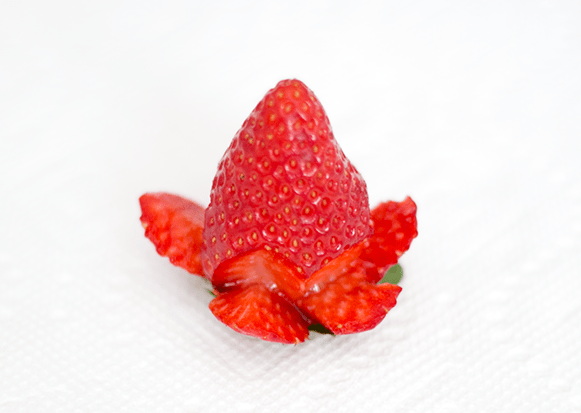 You want to use strawberries that are very firm so they hold their shape. 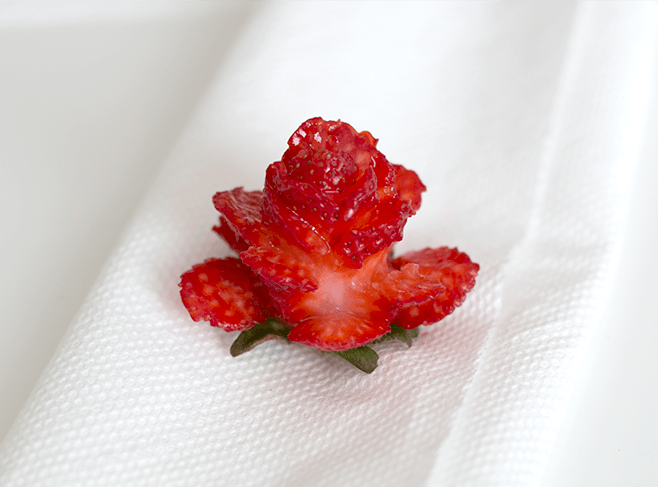 Place the strawberry on your working surface with the leaf side down. 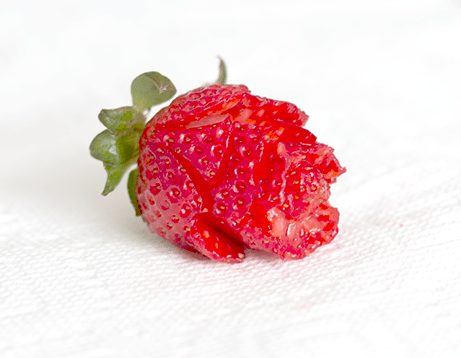 Hold the tip of the strawberry down with your index finger to keep it in place. 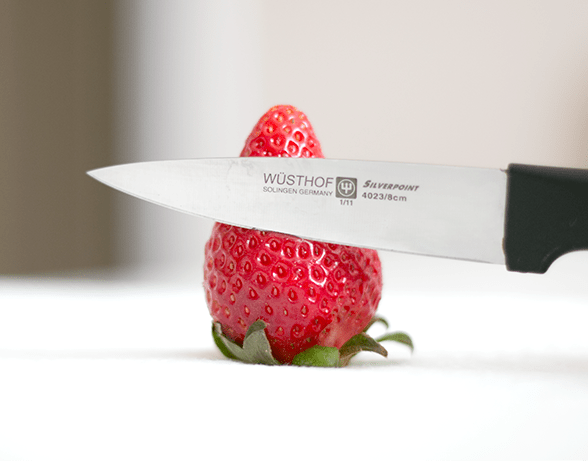 Place your paring knife in a similar position as the photo above. 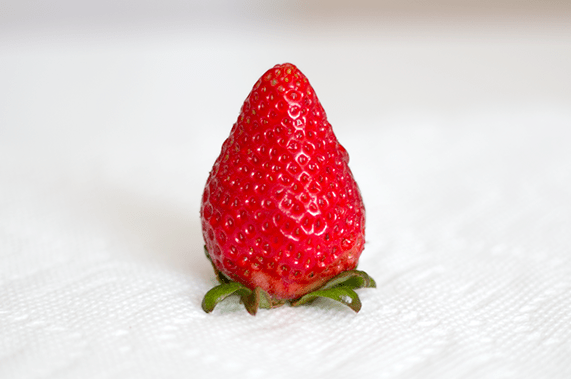 Remember to hold the strawberry down by the tip. I didn’t do this in the photos because I did not want my hands to get in the way of the picture, and I needed to press take the picture. 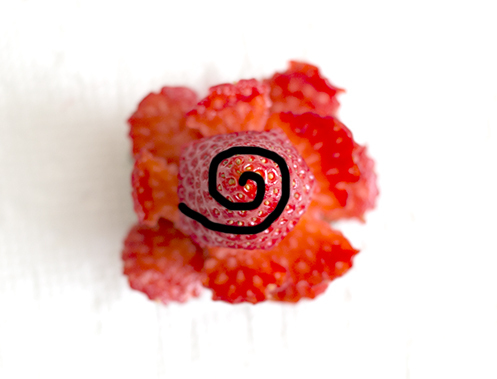 Point your knife downwards and cut a spiral to the tip of the strawberry. 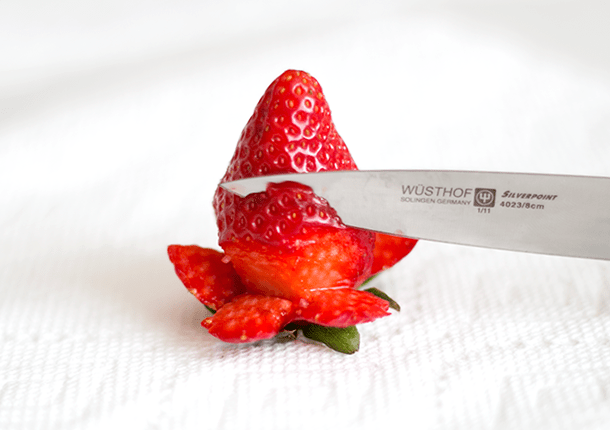 Use your knife or finger to spread the spiral apart so it looks like a row of petals leading to the tip of the strawbery. This is what the spiral will look like from an angle. 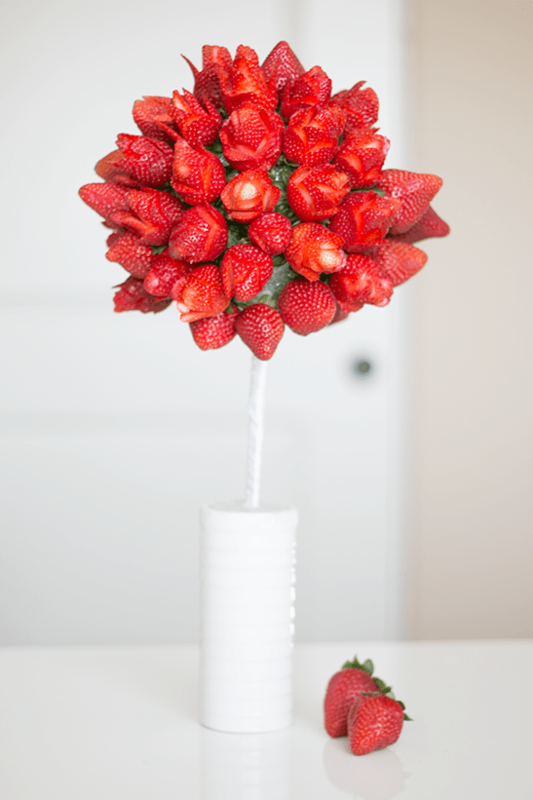 If you want to create a bouquet of these roses, insert lollipop sticks into the base of your strawberry before cutting it. 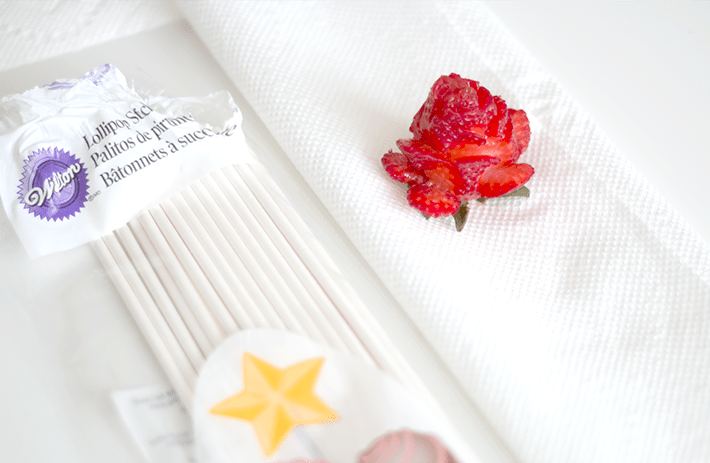 I also recommend using some candy melts or chocolate on the lollipop stick and at the base to use as the “glue” if you find that your strawberries will not stay. 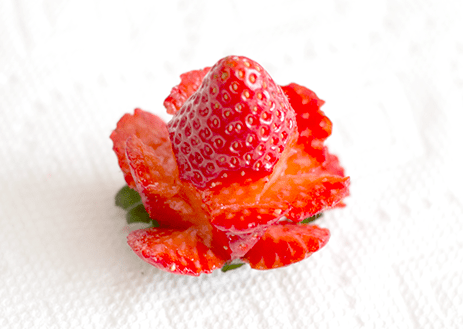 Please click here to see part two of the tutorial on how to make this strawberry rose topiary! I hope you’ve enjoyed my tutorial! As always, I’d love to see any of your creations and you can always share with me by posting it in the comments or tagging me on your social media post! Great tutorial yet again Ashley. I feel like even I can do this now. Thank you so much! It is really easy to do, I promise! This is so awesome! I am sharing on my facebook page! love it! Thank you so much for stopping by and thank you so much for sharing it, Lauren! I really appreciate it and it makes me so happy! Amazing!I have never thought of that! These are so cute Ashley! Thanks for the great tutorial. I am having a wedding shower next week with a tea party theme. I think these would be a perfect addition to our food table. Thanks for sharing! Thanks so much Debi! I would love to see your creation!! A tea party theme would be so cute! These look so easy to make and look wonderful. You had some great instructions! Thank you so much Stephanie! They are super easy! Oh my gosh Ashley! !This is wonderful! !…We are soooo gonna do this!Or attempt it anyway!..I included you in my mother’s day post!!! What a sweet bouquet of “rose”! Thanks for sharing this technique which will look good in dishes and bento! Ash, once again, just gorgeous! I loved the single strawberry rose, but once you put them all together, STUNNING!!! Just beautiful. The tutorial is very easy to follow. Any mom would love to get this piece of edible art for Mother’s Day! Or any day. Well now, those are the cutest strawberry roses, great job. This is awesome! Turned out beautifully and I will have to give it a try. Thank you Erickah! It is really easy! I wouldn’t want to eat this gorgeousness!!! Would make a lovely centerpiece for a nice tea party (or any other party!!!) love it! Thank you so much Grace! It is really easy to do! These are really beautiful! What a creative idea!Thanks for joining the Oh My Heartsie-Girls WW! Thank you so much Shellie! Thank you so much, Mila! It is very easy too! These roses are very creative. I’ve seen them somewhere before and never knew how it was done. I can’t believe how easy it is! Great tutorial! Thanks so much Kate! It is super easy! These strawberries are beautiful. I would have to eat them now. What a great job you did on them. I have always wanted to know how to do this! Thanks for sharing your tutorial with Hump Day Happenings. It’s super easy, Jenna! Thanks for stopping by! Thanks so much! I’ll be there! They look beautiful! And so simple to! I am making these for my sis’ birthday next Fri. I’m going to put them on a chocolate cake…yum! Thanks so much! I like it. what other fruits can be made into roses aside from strawberries. 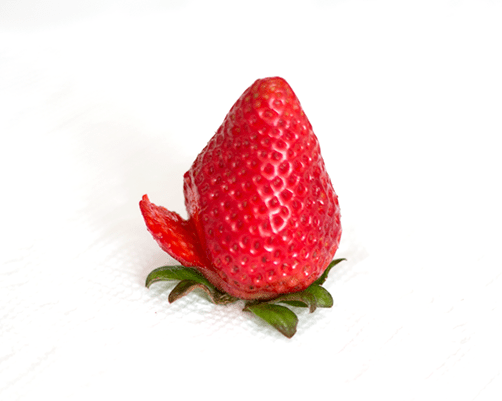 you know, am from the PHILIPPINES and seldom do we have strawberries . Thank you for the great tutorial! One question, can I make these today for cupcakes tomorrow? I was thinking on putting them in the freezer, any thoughts? 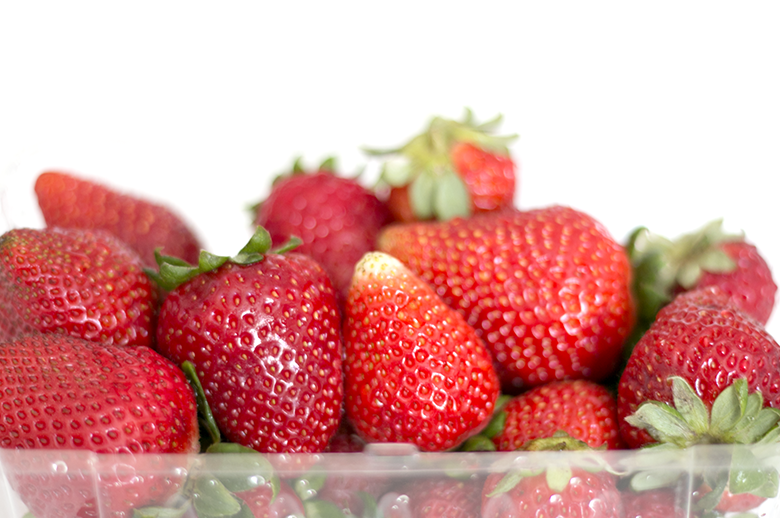 Oh my….these are going on my strawberry buttercream cupcakes! Wow. So awesome and so simple to. I live in Viet Nam. Thật là đẹp. I am making these for my sis’ birthday next Fri. I’m going to put them on a chocolate cake…yum! Hey! 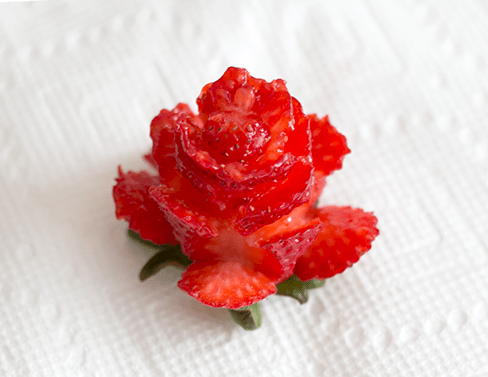 I’ve been playing around with these strawberry roses and think they would be so cute on a cake, but the strawberries ‘bleed’ a bit once cut…any ideas for how to keep those juices inside? Thanks for this! They weren’t hard, and turned out beautifully.